Best flanger i've ever heard. The two models have their own distinct feel. Various controls to really shape the sound. Incredible and light on DSP. Worth the money. Very much like the one I used to have. I love it! I put it on some funky guitars and also and bass and it does very well the job. Sounds oldie if necessary. Work like charm as a pedal. It's a nice emulation, sounds like I remember back in the day. I don't have the hardware anymore, so I can't do a side by side comparison. Not an effect to be used on every track or every song, but perfect when it calls for its one trick. I demo'd the A/DA a while back and loved it. I took advantage of the sale and now I can track with it whenever I want to. I love it on guitar. Me gusta el sonido que tiene. Tiene muchas posibilidades. Creo que lo voy a utilizar bastante. I've been using this on the new " Made N America CD quite alot.. Its remarkably good on vocals...lol. Better than anything else out there.. Check it out. I didn't notice this was in the library and when I saw it, It Hit me, an answer to my Rhodes sound. I was getting tire of it. Not only did I write 2 new songs the few hours after, I'm finding new ways to experiment with trying it on other sources, Like Drums. Love It! Beats having an actual pedal, sounds awesome, obviously digital is just as good and way easier, thanks to UAD! First off let me state, I got almost all the modulation plugins, and every one of them sounds amazing. the "Roland" chorus, MXR flanger etc. This A/DA is no exception. I tried all the presets first, and everyone one of them is useful on about everything. 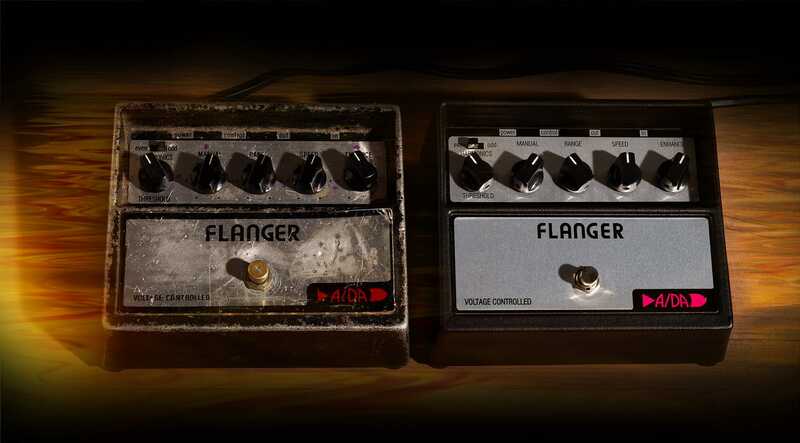 I am very pleased with this flanger, and I know I will make great use of it! love the fullness and richness of this plugin. good vibe and like the drive function. Not only another great UA emulation, but it covers some bases previously uncovered. Love on guitar of course. Plenty of sound choices with vintage and modern version! I have all the UAD flanger/chorus plug-ins as well as a vintage MXR chorus. This A/DA flanger is my favorite. Loe this plug-in. Been using it since I got it.